I just realized I've accumulated NINE looks that haven't made the blog, so I figured I should probably dump them now before they start to further multiply. 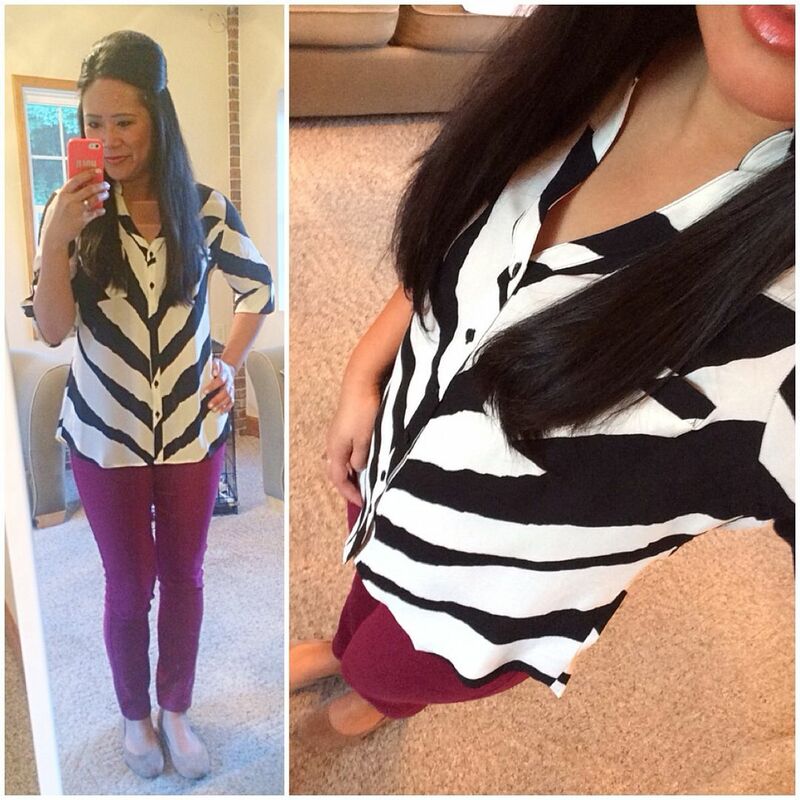 If you'd like to scroll through my past posts of outfit randoms - I've conveniently consolidated them all for you here. Yes, I'm considerate like that. And as always, I'm only linking to the pieces that are still available and not bothering linking to any duplicates. Though, if there is something you like that I have not linked to, I am more than happy to try and find you something similar - just let me know! Let's begin, shall we? This was a casual Friday dinner outfit with the husband. We ended up eating at Buffalo Wild Wings that night (so random, but they have the best sangria - seriously). This goes along with my whole summer sweater concept I just blogged about here. This sweater is sheer in some places, but since it was Friday night out, I didn't bother with a cami for modesty. I'm such a risk taker. You can also see this top here (be warned of the awkward posing), which honestly is one of my least liked looks on the blog to date. Speaking of looks I haven't liked on the blog - remember that Golden Girls outfit when I over accessorized? Yeah, this outfit looks wayyyyy better without all the bling. I didn't even wear any jewelry, but it didn't matter, I felt good in this outfit. The top was all the accessorizing I needed. 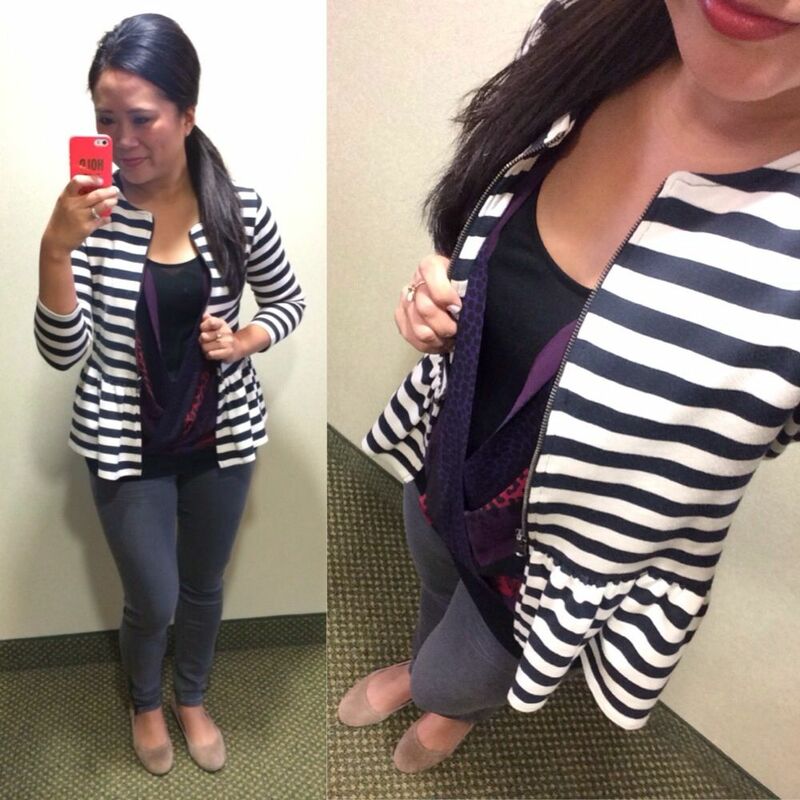 This ended up being a travel outfit - I had to go straight from the airport to a job site, partially under construction, then to a meeting with a prospective consultant, and then to dinner with that same consultant. This outfit made me feel fresh and relevant at all of my destinations. This is day two of that same work trip. I had honestly planned on wearing this outfit instead because it was the day I was meeting friends for cocktails and dinner after my work stuff was over. But, there was a threat of a torrential downpour, and I didn't want to be caught getting drenched in a white top. This ain't a wet t-shirt contest, this is work! So, I opted for this instead and wore the white top/olive skinnies combo to travel home and to the office in. And this is how I made the outfit a little more nighttime worthy - I was able to use the exact same accessories I planned on wearing with the white top/olive skinnies outfit. Lots of pattern mixing going on, but I still felt good in this. 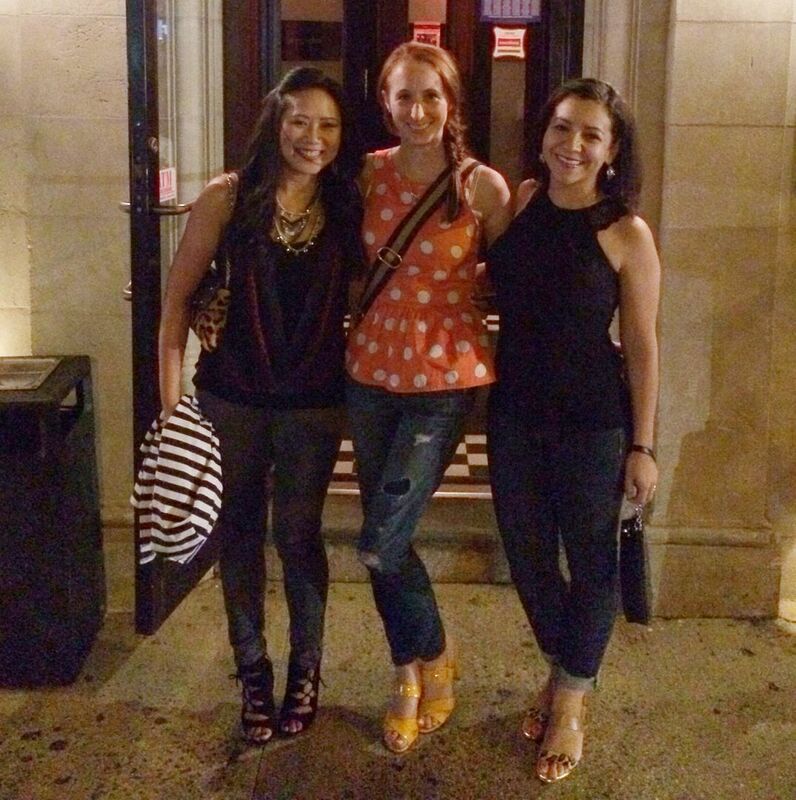 Oh, and here's a bonus pic of the three of us in case you missed it on Instagram. It was a lot of fun. I had watermelon martinis, which didn't work so well with my 6am flight and full work day, but they were worth it! Love these girls! And yep, Renata is wearing the same Sam Ed sandals I'm wearing in a picture below. She was one of my victims who I convinced that she needed them. Come to think of it, Joan has them, too! You know I had to throw in a random game day or workout outfit. Sigh, I love game day. My favorite Cardinal, Center Fielder Jon Jay, started this hashtag on Twitter called #highsocksundays because he and some other players wear their socks over their uniform pants. So, naturally I had to get a pair of my own so that I could wear them to every Sunday game we have tickets for. These are also the socks that made me famous. Yep, 3,861 people liked my socks, and that was just their Instagram! I was on their Facebook page, too. OK, I'm starting to get all excited and nostalgic, let's move on. This was day two of my birthday celebrations when we went for dinner with his parents. We went to this pizza place downtown call Pi - if you're ever in the STL area, you should try it! It's pretty amazing. I made it a point to wear sequins every day we celebrated my birthday. I mean, wouldn't you? This is what I wore to work on my actual birthday. Yes, I wore this to work. Yes, I can basically wear anything I want to work. I hadn't worn this top to work yet. The last time you guys saw it styled was here. I decided to skip the jeans for the sequins because of the occasion. The side knot worked out a lot better with the skirt also. For whatever reason, this is my least worn portofino. I can only remember wearing it twice (the last time here.) And both times I've reached for the same necklace and the same shoes. I need to branch out and find other ways of styling this. 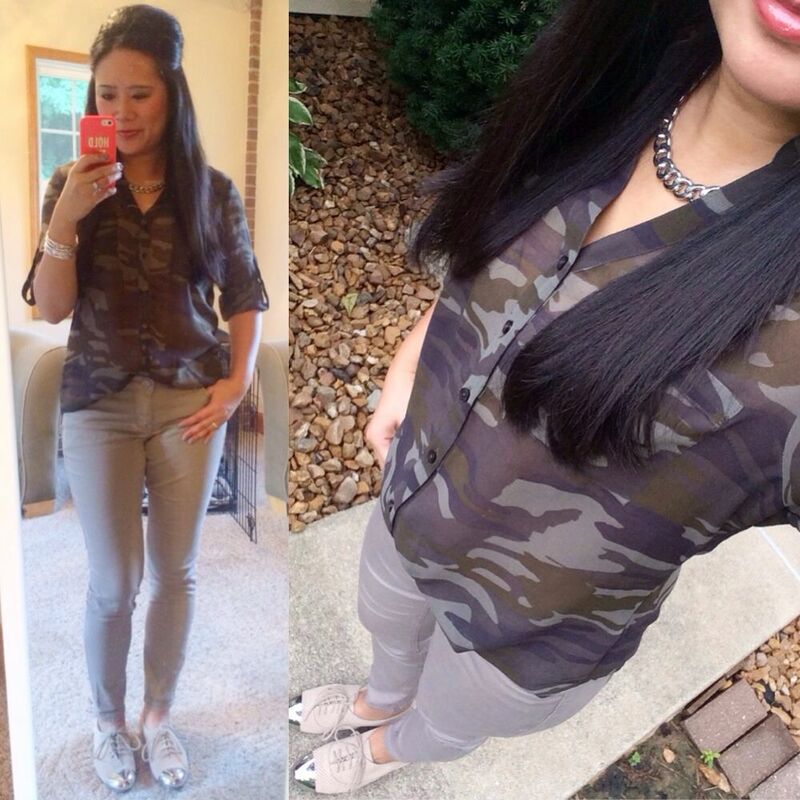 Funny how a camo top isn't as versatile to me as camo pants…. or perhaps it's that I don't own blush colored pants, polka dotted pants, or striped pants… Oh, but I do own burgundy pants - that would work! And last but not least is this beauty. Which really is my birthday outfit that I blogged about here. 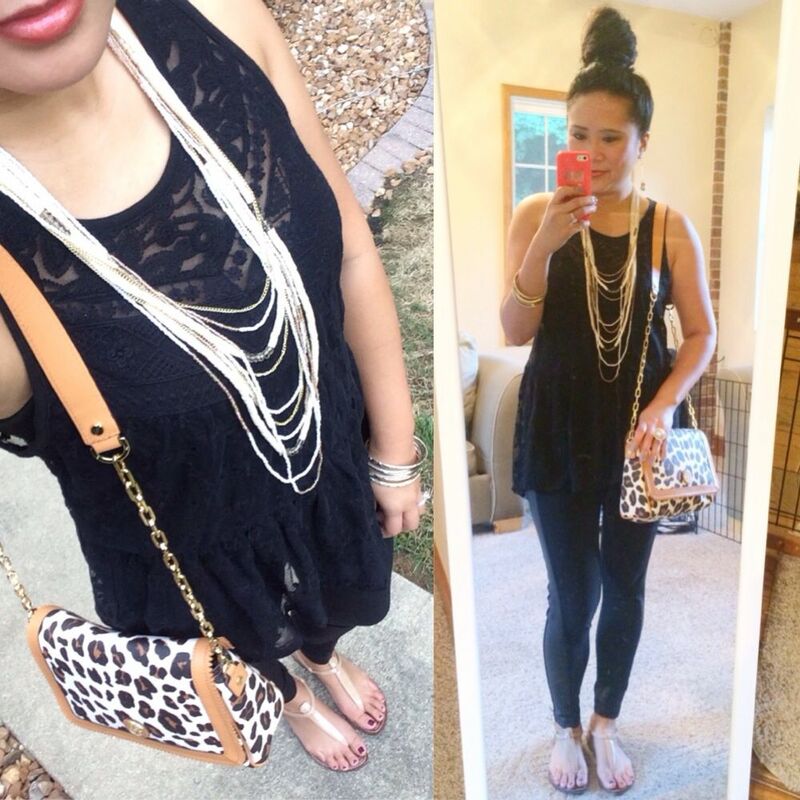 I simply traded the sequin top for this layered necklace, ditched the heels, and traded the Chanel for my new leopard bag. I love that the skeleton of this outfit is the same as the other, but the accessories, and even my hair, make them two totally different looks. Have I said how much I love these lace tunics? They're amazing. Seriously. 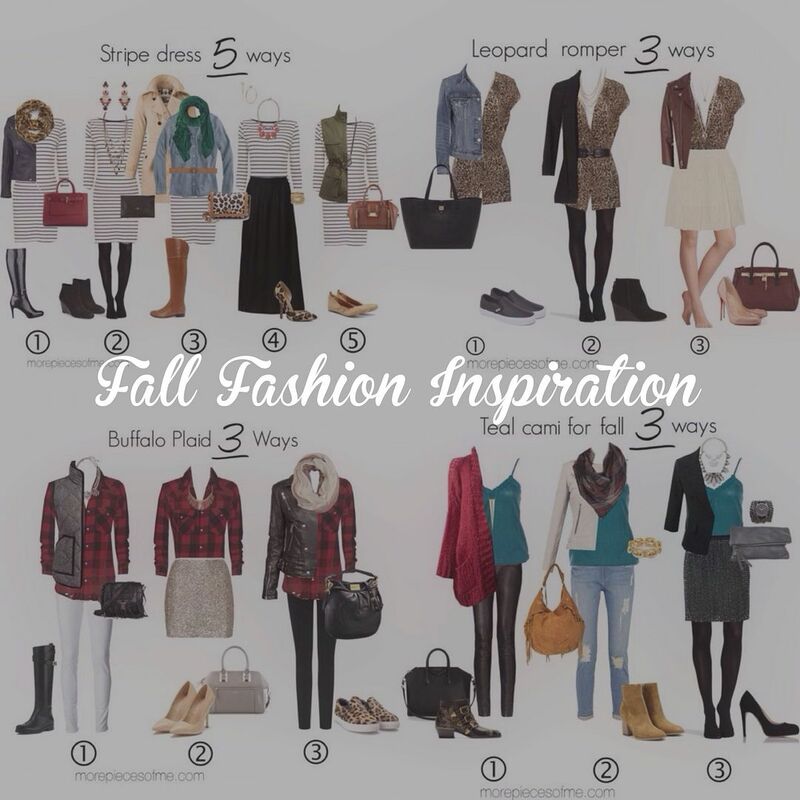 I hope you guys enjoyed my week's worth of Fall Fashion Inspiration. I'd admit, it was a bit time consuming on my part, and there were times when I questioned my life choice for putting it all together. However, I love looking at all the outfits I was able to create with the same pieces, and I hope you found value in them as well. If you ever want some input creating outfits around things - let me know, and I'm happy to offer my point of view! Please vote for More Pieces of Me in category #6 here! One vote per email per day until 9/19! Visiting from Musings of a Housewife. That jacket is my favorite! Such a good find - I bought it after seeing it on another blogger! Love these looks, especially the sequin skirt! Happy Friday! oh I know this is time consuming but I am seating here reading and clicking and being pissed when I realized something is sold out lol. 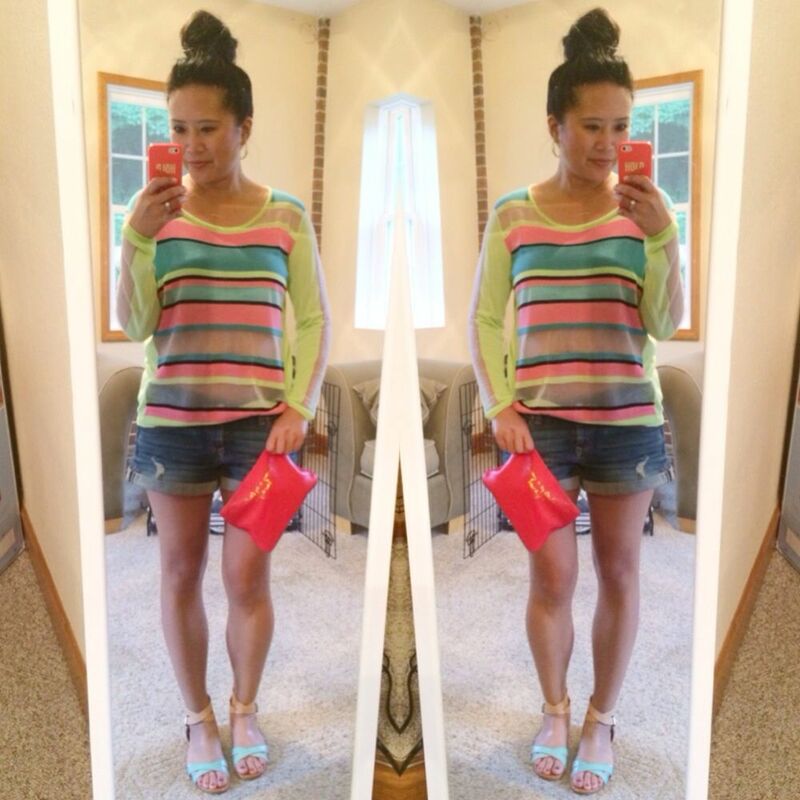 These are my favorite posts of yours and I want all your sam edelman's sandals. Aww - sorry to get your hopes up!! Glad you enjoy these posts! Yes, I have absolutely enjoyed your "now and later" posts all week!!! I've loved all the looks you put together! You also have a great collection of sequin skirts girl! Thanks for the voting reminder...just did it. :) And ahhhh this post was SO delicious! It's like sitting down for a Thanksgiving Feast. So many parts to enjoy. I loved seeing each outfit and reading a little about where you went, what you did, and what changes you made or might make to the look. It's quintessential personal style blogging to me and what made me fall in love with fashion blogs in the first place. So if you get bored and want to question your life choices this weekend, go ahead and make me some fall style boards for the red (now available online) and cobalt Barcelona cami, mkay? Thanks!! I really am glad you like these posts. A) it's nice because it lessons the photo load I have to do on the weekend and B) it's a great way for these outfits to get showcased and for me to properly discuss them! 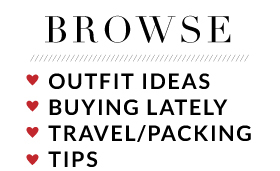 And yay for Polyvore! Cobalt is my next mission!! You must have an amazing closet! I have outfit jealousy for every single look. I seriously "need" a sequin skirt, striped jacket, camo top,......you get the idea. It is so fun to read your stories of where you wore it and why. I really enjoy these posts! Thanks so much, Tracy! It makes me feel good that you enjoy it that much!! This was the best post! I love the first sweater and shorts outfit and your Cardinals look is adorable! I was excited to see you in the sequin skirt and tees! 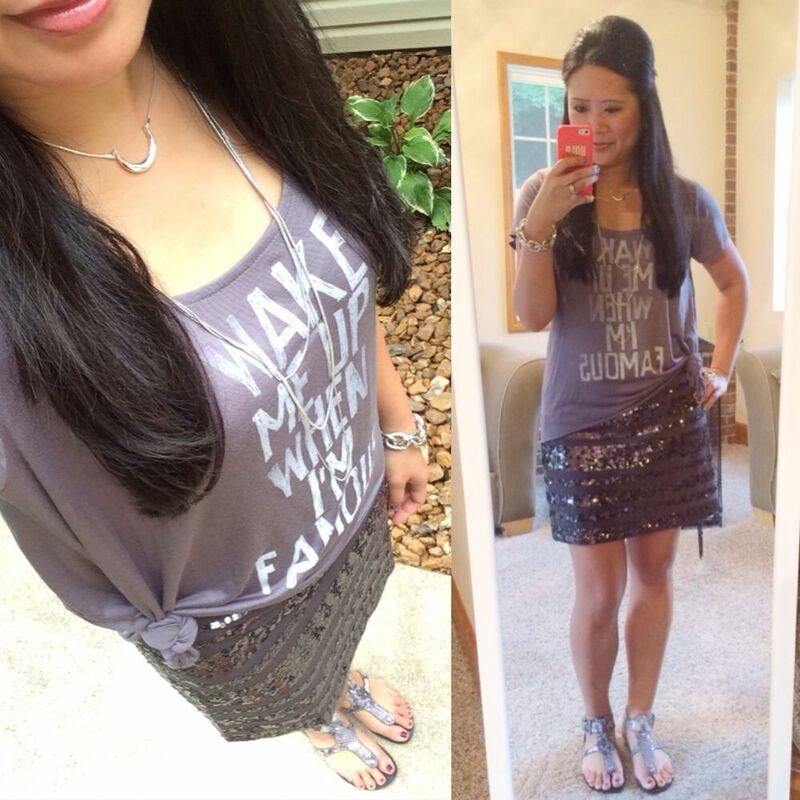 I posted today on styling sequins for day! I have to say other then the fact that I love your looks, I love how you change up your hair with each outfit. So pretty!!! Thank you for noticing!! With long hair it can get boring, so I try and change it up! 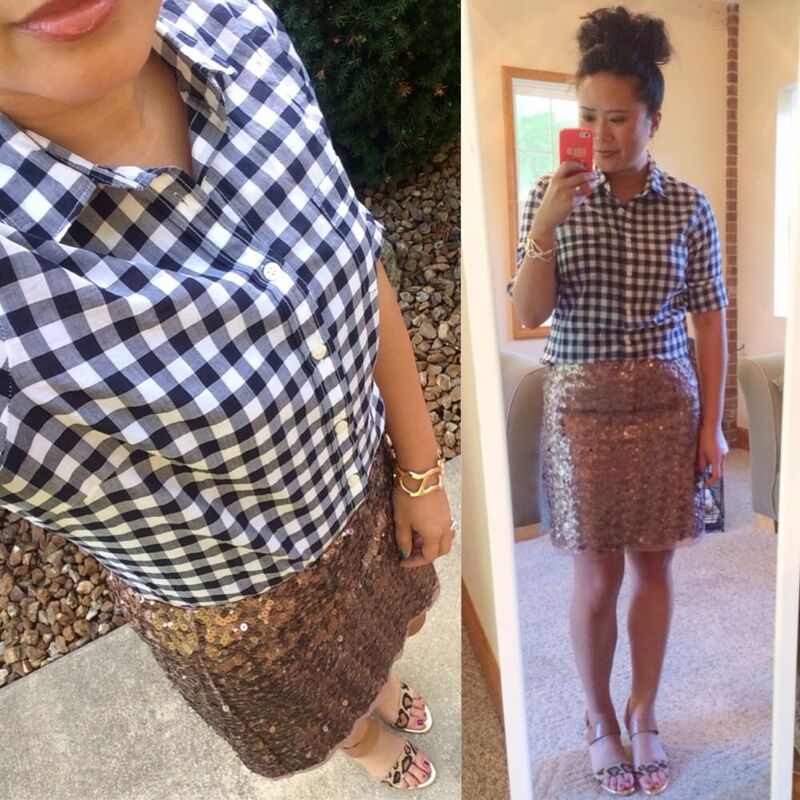 Gingham and sparkle! I LOVE IT ! 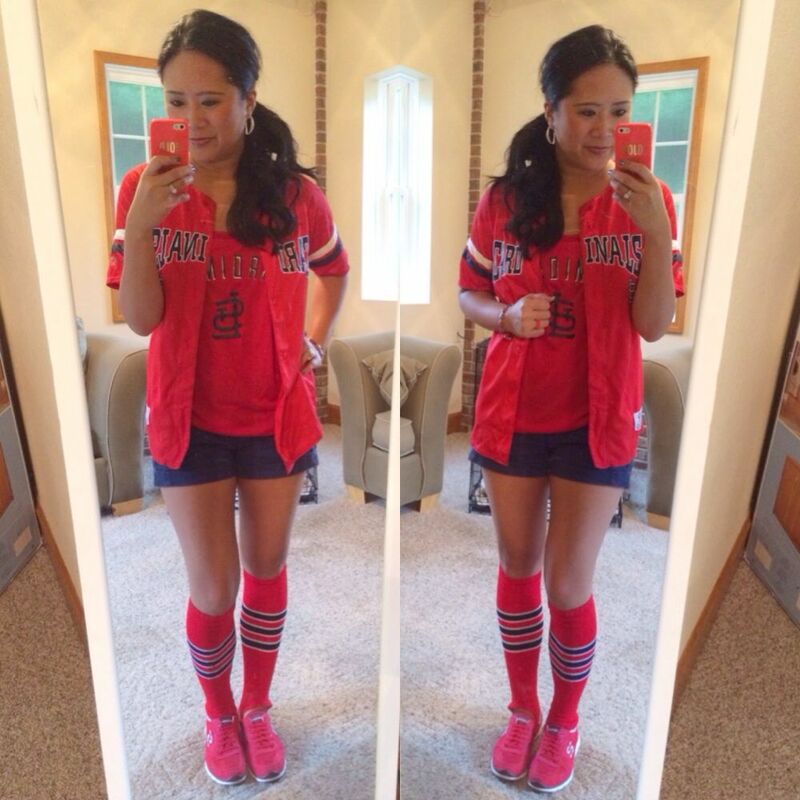 I love the cardinals outfit look, because I'm a Cards fan too! You look great! Love the ZARA peplum stripe jacket and the Lauren Conrad sequin skirt - such pretty pieces! I bought the jacket after seeing it on Jenny from Crazy Style Love. It's been such a staple ever since! 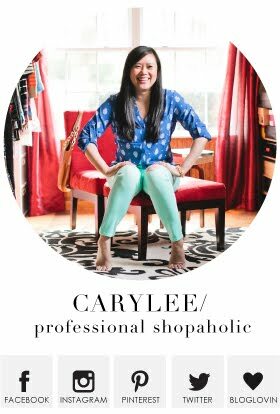 Carylee, I love those Rebecca Minkoff sandals! You loom super cute with your high socks! Congrats on all those "likes" on IG! Also, love your work-to-night outfit! So many great looks! Love your style. 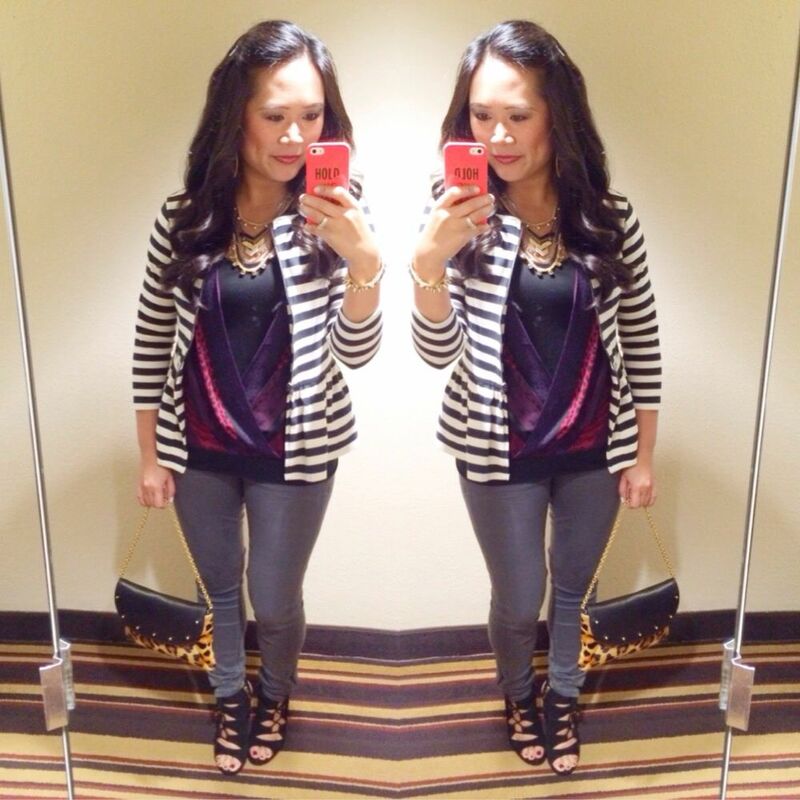 :-) Thanks for linking up to #FashionFriday! Sequins are the best! Glad you agree!! Great roundup of outfits - thanks for sharing with us again at the #WWDParty. Love all these wonderful looks! Thanks so much! I appreciate you stopping over! Your outfits are really cute here, but I'm really, really loving all your hairstyles. :) Your hair looks beautiful! I will def vote for you...good luck!! Thanks so much for the vote and the compliment! I don't know why I feel the need to change my hair up everyday - I get bored really easily with it since it's long and just kinda hangs there! So thank you!